2001 Palacios Remondo Rioja Propiedad H. Remondo, $24. I first tasted this wine, a blend of 55% Tempranillo and 45% Grenache, at Rosewater Restaurant in Park Slope, Brooklyn. This was over a year ago, and we liked the wine enough that we bought 3 bottles for our "cellar" at Prospect Wine Shop. This is the first one we've opened. Dark purple with clear rims, this wine has aromas of vanilla, but not as overwhelming as I find in most Riojas. There are smells of spices too, mostly cinnamon. After about 30 minutes of air time the wine opened up to reveal juicy blackberries and plums, and went perfectly with lamb and sweet potatoes - hearty fare. I expect really good things from this wine in a few years. 2005 Catherine and Pierre Breton Bourgueil Trinch!, $17. Trinch is a French word used to describe the "clinking" sound of wine glasses during a toast. This is a cuvee meant for drinking young, and probably as casual table wine - nothing fancy. I really liked it though, and I imagine that it is amongst the best such Cabernet Franc wines of the Loire Valley. Deep opaque purple, this wine smells of herbs, black fruit, and wild animals. Leather, like the inside of a boot, brambly piles of dead leaves, tar, and some juicy black plums in the mouth. This wine absolutely needs food, to me, and with food it is a sincere pleasure. The Bretons are, to me, amongst the most reliable producers of red wine in the Loire Valley right now. 2003 Domaine du Closel Savennieres les Caillardieres, $17. Closel's second wine, I guess, in the sense that it is not meant to age for more than 2-5 years (Clos du Papillon is their top wine). Wines from les Caillardieres are always thrilling because they offer the firm minerality of Savennieres but they are usually off-dry and offer great acidity and a honeyed sweetness too. In this way les Caillardieres wines have something in common with its cousins in Vouvray. This wine, from a so-so year, has been excellent each time I have tasted it, with well delineated smells of peaches, wet stones, and honey, and those same flavors on the palate, also some citrus. Fresh tasting and round, this wine is very satisfying with richer fish dishes. 2002 St Innocent Seven Springs, $32. This is wine maker Mark Vlossak's flagship wine, and the St Innocent bottling that can improve in the cellar for the longest time. I bought two bottles a couple of years ago, and found a great deal on 6 more a few weeks ago. That made it easy to open one with Deetrane, even though we knew it was not ready, possibly even a bit closed down. It was, in fact, closed down, but even so, this clear dark purple wine exhibited the finesse, depth, mix of clean fruit, forest, and animal flavors and the balance of a fine Burgundy from the Cote de Nuits. Yes, it took over two hours open to get there, and yes, I think that we saw only the surface of what this wine will offer in five years. If you are lucky enough to have some of this wine...hold onto it for a while longer. 2003 St Innocent Shea, $32. I first tasted this a little over a year ago and I was not impressed. Much heavier, clunkier, flabbier than I expect from St Innocent. What a difference a year makes! This wine is darker and more muscular than most St Inn's, but it has found its footing. Loads of flowers and dark fruit on the nose, with heavily extracted black fruit, pine, and mushroomy earth in the mouth. A bit loud still with the alcohol, but this was a tough year, no? 2004 Adelsheim Elizabeth's Reserve, $40. Too early, to be sure, but I love this wine and I just couldn't wait. Deep ruby with smells of fresh cherries and cooked fruit. Huge right now, need some years in the bottle still, but with some time open, especially on the second day, the wine revealed some complex mushroomy smells too. Bright red fruit character on the palate with some pine. Some alcohol heat, which would hopefully. Very good wine - could be great. 2001 Lafarge Volnay 1er Cru Clos des Chateau des Ducs Monopole, $85 (but I got it on the secondary market for $27). I loved the Lafarge Volnay 2001, just the village wine. I learned from tasting this bottle, though, that 1er Cru does not necessarily translate to better. This wine was just strange. Liquor-like smells of cherry. Waxy candy, one dimensional palate of cherries. Something went wrong here - did a hail storm damage the fruit? I would trade my three remaining bottles for one of the 2001 Volnay village wine. I also tasted several Bourgogne wines of varying quality. These wines basically hammered home for me the fact that for everyday drinking Pinot Noir, Bourgogne level wines, if you know which ones to get...I shudder to say this, but... are probably a better value than most Oregon wine. 1998 Domaine Robert Groffier Bourgogne, $14. Nice strawberry smells, some pine too. Very pleasant balance of berries and earth on the palate. Hard to argue at this price. 1999 Domaine Hubert Lignier Bourgogne, $22. Nice clear rose petal color, lovely aromatics of red fruit and flowers. But no fruit at all on the palate, out of balance. Acidity and phenolic bitterness dominate. Maybe it was meant to be consumed much younger - past its prime. You can sort of tell that it was good a few years ago. 2002 Domaine Robert Groffier Bourgogne, $26. Bright aromas of flowers and red cherries, some earth. Somewhat simple palate follows through on those smells, but lively and clean in the mouth, some undertones of leather after some air time. Good acidity. No awards for complexity, but very solid Pinot. 2004 Domaine Joseph Voillot Bourgogne Vieille Vignes, $22. Pure smells of raspberries and earth, with lip smacking acidity and cherries on the palate. This wine becomes much more complex with air time, and develops some pine and foresty flavors. This is the best value of them all, and you can still get it in stores...and if you like Pinot, you should! It's the time of year when we resolve to make changes, to improve ourselves in some way. I will not bore you by describing my plan to go running more often, to spend more time with friends, and things like that. This is a wine and food blog, so I will share my wine and food resolutions for the coming year. I will find more wine at the $15 price point that I truly enjoy. I took stock recently and realized that about 80%, maybe more, of the wine I drink at home costs at least $25. I looked at a a report of my wine consumption in Cellar Tracker, the useful wine inventory and community tasting software created by Eric LeVine, and I see that my 2006 average value per bottle is $24.31. If I have wine 4 or 5 nights a week, that means I'm spending too much money, especially as we are about to have a baby. But I don't want to sacrifice quality - I want to drink good wine. I will devote some tasting time this year to exploring $15 Pinots and if I can find one or two regions and producers that I like at that price point, I can indulge in what for me is the ultimate grape without spending so much. I can open a good Pinot once or twice a week. I also love Loire Valley reds, and top producers make wines that cost $10-15. I should drink more of them. Beaujolais, the southern Rhone Valley, Languedoc, and Provence, New York, and Piedmont are wine areas that offer quality wines at reasonable prices. I will find my favorite $15 bottles in those areas too. I would like to bring my average cost per bottle down to $20 for 2007. I will drink less alcohol. I always check to see the alcohol level of a wine, but I want alcohol level to play more of a role when I select and purchase wine. 13.5% is a reasonable benchmark for me - if a wine is higher than that and I have a decent alternative, I will do so. Of course, this might make it tough for me to drink too much of the Oregon wine that I love...which brings me to the second part of this resolution. My friend NorthCarolinaGal suggests that good health requires not drinking any alcohol at all for two days every week. Sounds like a good move for me. Not because I am worried about alcoholism or anything like that, but because moderation is always a good thing. I will do more blind tasting. I think that tasting blind is a great way to level the playing field, to challenge myself to experience and compare wines without bias. It's also just plain fun, and a great thing to do with friends. I will be more selective about the wine I put in my cellar. Actually, I don't have a cellar, but I have a Eurocave wine fridge that fits 100 or so Burgundy-shaped bottles. Its full now, and not all of the bottles are wines that I would buy today. For example, why am I devoting 2% of my cellar space to Australian Syrah, even if it is produced by Two Hands and supposedly delicious? I don't know anything about Aussie wine. That space might better be devoted to age wine that I actually understand, so that I can detect the benefits of aging when I drink the wine. Should I sell them on the secondary market? Drink them before their prime? In any case, I have a better sense now about the wine that I want to cellar, and as wines leave the fridge I will be more thoughtful about replacing them. I will eat more lunch and less dinner. Big portions at night just don't make sense. You go to sleep soon after eating and cannot digest well or burn off calories properly. Problem is, the only meal that I get to share with my wife or friends is dinner, the only meal over which I can linger and enjoy wine is dinner. My solution will be to eat larger portions at lunch and smaller portions at dinner. So that's a good start, right - four resolutions. Now let's see if I can stick to them. What are your resolutions for the new year? We went a little over the top for this holiday version of Wine Dinner. BrooklynLady and I hosted, and we settled on the theme of Burgundy, in honor of our recent trip. Our very good friends Deetrane and his wife (and 2 month old son), and NorthCarolinaGuy and his wife NorthCarolinaGal wined and dined with us. Such a great way to spend some time with friends near the holidays - celebrate all good things together over a good meal. BrooklynLady and I prepared a 5 course dinner and everyone was asked to bring a mature red Burgundy. BrooklynLady and I put together the rest of the wine. Overall it was a hedonistic wine and dinner experience, that a brisk jog around Prospect Park the next morning did little to counter. We nibbled on unsalted almonds and toasted with a bottle of 1998 Pierre Peters Champagne Grand Cru Blanc de Blanc Brut Millesime. This bubbly was surprising in its weight and power. It had sherry-like notes at first, seemed a bit over oxygenated. But after a few minutes it found its footing, and had nice almond and toast aromas to go with big mineral and nutty flavors. Unusual to me in that I detected no actual fruit in this wine, but plenty of minerally, nut, and herbal characteristics. I think I need to try more Champagne. Deetrane said that his favorite wine pairing of the night was actually the almonds and this Champagne. The fish soup came from the stock I made and froze, and although the broth was okay, it was nothing like it was when I first made it. The bright flavors didn't survive the freezing and defrosting. The quenelles, my pal Adam's suggestion, were fun though. The simplest dumplings in the world, they were simply fresh flounder, cream, and grated nutmeg, all combined in a blender until smooth. Shaped using two tablespoons and poached. They had the consistency of matzoh balls, and in fact looked like matzoh balls. The aioli was my favorite part of this dish. I have never before made aioli or any kind of mayonnaise, but this recipe from Gourmet was so simple and delicious - I might be making this regularly, to the great sorrow of my cardiologist (when I get a cardiologist, that is). It would be great with boiled shrimp or any kind of seafood and brown bread. It was great the next night with simple fried flounder. We had 2005 Domaine Roulot Bourgogne Aligote with the soup, and it was exactly as it should be - light, crisp, clean tasting, briny and citrusy acidity. Deetrane reminded us that Aligote is the wine traditionally used to make a Kir (an aperitif using white wine and a touch of creme de cassis). I happen to have some cassis lying around the house and will investigate later today whether or not this Aligote does the job right. BrooklynLady lined the bottom of her home made quiche crust with fresh thyme, and the mushroom and shallot mixture combined with the thyme to produce a potently earth quiche. I loved it. We opened (an hour before eating) two white Burgundies to taste with the quiche. With a little research I decided to focus on the 2000 vintage because it is considered a good, not great but good, vintage for white Burgundies, and more importantly because the wines should be ready to drink. 2000 Joseph Drouhin Puligny-Montrachet 1er Cru Clos de la Garenne. Lighter, fresher nose than the Pernot, with a little bit of a floral component. The texture was more medium bodied, and the oak less prominent. Very nice minerality also, with, to me, a rainwater purity that I usually associate with Loire Valley wines. I liked this wine very much (particularly the next day on its own...sip...sip), but the quiche might have overpowered it for me. We had three reds (opened 90 minutes before drinking) with the lamb, each interesting and immensely enjoyable. 1995 Domaine Newman Latricieres Chambertin. This is a Grand Cru vinyard in Gevrey Chambertin, and Deetrane says that this is some American guy who bought vines and basically became a French man who makes wine. I have not yet managed to find out more online about this wine, but I am hoping that Deetrane will chime in with a comment explaining a bit more. As for the wine...bright and deep ruby, with appealing redfruit and spice smells. Classic Pinot flavors of earth, redfruits, and spices, with a medium bodied mouthfeel. This wine was delicious and it kept improving over the course of the evening (and tasted great the next morning right out of the decanter that I never washed out). The one issue that some of us noticed, though, was that it had a weak-ish finish. 2000 Ghislaine Barthod Chambolle-Musigny 1er Cru les Cras. This wine had more purple to it than the others, and a soaring nose of bright red fruits, some bay leaf or cedar also. Les Cras is the southward continuation of the Bonnes Mares Grand Cru vineyard, and the wine shows the power and elegance you would expect. Bright red fruit flavors with cranberry acidity carried through the palate. This was a very pretty, food friendly wine with an elegant and perfumed red fruit personality. Madame Ghislaine is apparently a rising star in Chambolle-Musigny, and her Bourgogne Rouge is supposed to be one of the best values in red Burgundy. This post is getting pretty long now, so I will be quick about the last two wines. We opened a bottle I brought back from our trip, a 1986 Louise Perrin Cotes de Beaune Villages. I loved this wine when I tasted it at the Domaine, and I enjoyed a delcious glass of it by the fireplace before dinner one night. But on this night, with 5 scrumptious cheeses (inlcuding the very Burgundian Epoisses), it was more odd than anything else. Deetrane immediately detected oyster liquor, NorthCarolinaGuy agreed, finding seaweed. I thought it smelled like rotting vegetables and tasted like Japanese rice and seaweed crackers. Hmmm...I guess after 20 years, a Cotes de Beaune Villages might vary a lot from bottle to bottle. With our dessert we opened a well aged Loire Valley sweet wine, a 1990 Pichot Vouvray Moelleux Domaine le Peu de la Moriette. All I can say is YUM! I love these old Chenin Blancs. This one was golden amber honey colored with a lively floral nose, some apricots too. Pure flowers and honey in the mouth with a minerally rainwater finish. I could drink this wine constantly, and I did enjoy it tremendously as an aperitif while cooking dinner the next day. Alder at Vinography reviewed the 1996 vintage of this wine here. Everyone seemed to like this one. I hope that your holiday dinners are spent with the people you love, and that your wines and eats are delicious. I hesitate to do this, because right now it's still basically a secret. Wine Spadvocator and other such publications are not touting this wine. I can go to either of my favorite wine stores, Chambers Street Wines in Manhattan or Prospect Wine Shop in Brooklyn and they both have bottles in stock. This is in spite of the fact that wine gurus at both stores highly recommend this wine. And at less than $20 a bottle, it's not like the price tag is scaring people away. Maybe it's because the Loire Valley doesn't excite people the way Bordeaux or the Napa Valley excite people. Maybe it's because this wine is obscure even within the Loire Valley. Whatever the reason, anyone can buy Cour-Cheverny wines as long as you have a decent wine store near you and a twenty dollar bill. You should try them, honestly. Cheverny wines are a blend of Sauvignon Blanc and Chardonnay, with the Sauvignon Blanc the primary grape at about 70%. These are pleasant and food friendly wines, but they are not the inspiration for this post. Cour-Cheverny wines are made from 100% Romorantin, an old grape that's unused elsewhere, as far as I know. Romorantin produces dry wine with pronounced minerality and sharp lemony acidity. An inexpensive and fun wine to enjoy with fresh shellfish, for example. Typically costing about $12-14, these are affordable wines. These, while delish, are also not the real inspiration for this post (but getting closer). Francois Cazin is one of the only producers of Cour-Cheverny wines. 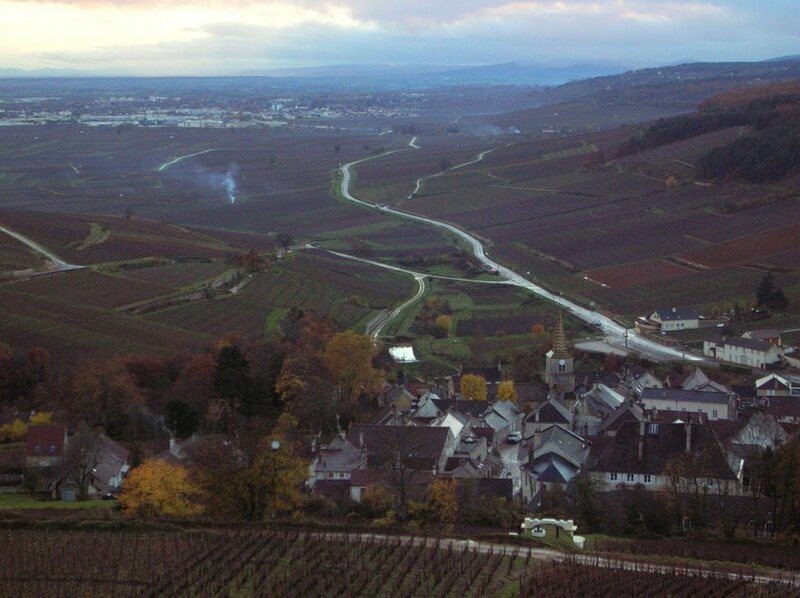 There are some vintages, though, when weather permits, and noble rot sets in, that allow Cazin to wait longer before harvesting some of the Romorantin grapes, resulting in higher sugar levels and additional flavor characteristics. Like the great Chenin Blanc grape, also a daughter of the Loire Valley, Romorantin might show best in its demi-sec (off-dry) form. Francois Cazin's version is called Cuvee Renaissance and it is superb wine. At $18 a bottle in NY, maybe less elsewhere, I think it represents one of the best values in wine. QPR people should go nuts over this wine. Approachable when young, Cuvee Renaissance has fresh floral and fruit aromas, with citrus oils too. The flavors are vibrant and pure, with a harmonious balance of acidity, honeyed sweetness, and minerality. I have never tasted an aged version of this wine, but I hear that it has something in common with Riesling, in that the aromas and flavors can take on a petrol quality, and the delineation of flavors and aromas becomes quite thrilling. I will certainly age some of the current crop. The 2oo2 Cuvee Renaissance is surely gone by now, but if you ever stumble across it you should pounce like a jungle cat! Eric Asimov mentioned this wine in his Thanksgiving Wines column a few months ago, but he didn't identify the wine as Cuvee Renaissance (the $18 price he quoted gave it away). I had a few bottles and was unable to exercise patience - I drank them all, foolishly. None was produced in balmy 2003, but my heart is gladdened to see the 2004 Francois Cazin Cour-Cheverny Cuvee Renaissance, $18 in stores. This wine is beautiful: fresh and pure tasting, with floral, fruit, and honeyed character. It's not at all a dessert wine (they never are), but the honeyed character does add noticeable sweetness. I drank the bottle over 3 days and the wine was at its best near the end, suggesting to me that it will reward cellaring. So that's it - my formerly secret amazing wine value recommendation. I warn you though, don't make me push past you on my way to the rack, because I will do whatever it takes to get my share of this wine! Although I think that buying foreign currency is a good hedge against your domestic investments, this is a post about the other kind of stock. Home made stock is such a great thing to have in the kitchen. Soups made with your own stock just taste better. They add a depth that is impossible to achieve with water or with canned broth. I am not one of those annoying people, though, who will smirk and tell you how easy it is to make stock. Why are they smirking - because they know that it is actually difficult to make good stock. You have to start with the right ingredients. Stock made from chickens available in your typical store, even the organic free-range raised-on-Beethoven chickens, just don't have enough flavor to make great stock. It's because they are too young, they haven't used their muscles enough, even if they are free-range chickens. Older, tougher chickens make great stock, although you don't necessarily want to eat the meat from such chickens. My secret source is Tello's Farm. They sell amazing farm fresh eggs at The Grand Army Plaza Greenmarket every Saturday. They sometimes have hens too, and these babies are the real thing for stock. What else should you use when making stock? I have limited experience with red meat stocks, but for chicken stock I like a whole garlic bulb, an unpeeled quartered onion, a parsnip, a chopped carrot, a slice of ginger, a couple of black peppercorns, and maybe a few sprigs of parsley. I do not use celery because I find that it imparts a metallic taste. Some swear by hard cheese rinds, although I have never tried this. For vegetable stocks I also load in the leeks. I have noticed the "free fish heads for stock" sign at the fish stall at the Greenmarket for months now and I never felt brave enough to ask for some. I have never made fish stock before, and what if I cop out and don't make the stock, then what? This Saturday, after purchasing a pound of lovely looking and ultra fresh sea bass fillets, I heard myself say "Can I have some fish heads for stock?" The lady nodded and pulled out a huge whole bass from a cooler, missing only the fillets. I guess its not just the head that you get. I pulled out my copy of Bones, by Jennifer McLagan, a pretty darn good cookbook that celebrates slow roasting, braising, and other cooking of meat and fish on the bone. The recipe for fish stock sounded straightforward enough, emphasizing a short simmer and the use of white wine. First major problem: I haven't gutted a fish since I was a kid at camp. This bass required gutting and cleaning, and that turned out to be disgusting. Especially since I have no clue how to do it. I basically cut the fish open and started pulling things out. Second major problem: removing the gills. The recipe said that the stock will be bitter without removing the gills. They were firmly attached to bone and it was an epic struggle, the bass gazing sadly at me the whole time with its large eye, as if to say "Go ahead friend, take out my gills, I understand. You CAN take out my gills, can't you?" It took me an hour to clean and chop the fish! Then apparently it's good to soak it in ice water (photo, left) for 15 minutes to draw out any blood in the bones. Okay, now the fun begins. I sauteed some carrots and onions (no garlic - seemed like it would be too powerful for a delicate fish stock) and added the fish (photo below). I had no leeks or I would have used 'em. Then about a cup of white wine. I used a 2005 La Buxynoise Bourgogne Aligote, $13 that my pal Adam served at brunch with bagels and lox. Aligote is the other white wine grape in Burgundy, and is great for everyday drinking, especially with escargots or seafood. This wine is fragrant with citrus and a bit of toast, crisp with steely minerals and lemony acidity. It is a very good value and delicious with food. I think that you should cook with wine that you like to drink - cooking with yucky wine doesn't make sense to me. Won't the food taste like yucky wine? Some parsley, some bay leaves, some black peppercorns, some water, a boil, then a slow simmer for a half hour (simmering stock, left). The kitchen smelled wonderful and the stock really tasted great, before any salt too. Line the sieve with cheesecloth, strain, pressing the bones and vegetables for extra juice, and voila. I salted the stock and the flavors sang out like Ella Fitzgerald. We had to use some of the stock with our dinner, so we pan roasted the bass fillets and placed them atop a puree of rutabaga. I deglazed the pan with fish stock, added a splash of white wine, some little carrot and onion cubes, let it cook down a bit and then added a pat of butter. So good, if it weren't for the gutting, cleaning, and gills I would be doing this all the time. And the Aligote went great with dinner! We went out to dinner with a few friends on Friday night to a new-ish place in Ditmas Park called Farm on Adderly. Ditmas Park is an up-and-coming neighborhood in central Brooklyn, near the Flatbush and Midwood sections. Many people would say that it's part of Flatbush. Full of old Victorian homes with wrap around porches and plenty of room for the car(s), this area has been attracting young couples who can no longer afford to pay for space in Park Slope, for example. Farm on Adderly opened in July (I think) to much fanfare, both because the area needed a high end restaurant, and because the food received great reviews early on. The service was professional, but in a casual way. Plates were all cleared at once, instead of the typical clearing as you finish eating, leaving the person still eating feeling like a jerk. Bread was replenished, as was water, waiters were not intrusive but were there when we needed something - professional. Our waiter joked around a bit, mostly at his own expense, and he charmingly brought over a few free desserts to compliment those we had already ordered when he saw us exchanging gifts - "I thought it might be some one's birthday," he said. Excellent starters included house charcuterie plate (the spicy sausage was my favorite), house pate de campagne (rich and light at the same time, perfect with the cornichons), and butternut squash soup. Good appetizers included a special of shrimp poached in olive oil served with pickled cucumbers. The cucumbers were awesome, but the shrimp had little flavor and were overcooked. A bibb lettuce salad with a goat cheese fritter was fine. Excellent entrees included grilled sliced hangar steak - tender, nicely charred, very flavorful. A special of brisket was delicious too, perfectly prepared, falling apart, yummy with its polenta accompaniment. And appropriate for the first night of Chanukah. Good entrees included pork filet and roast chicken. In every case except for the special brisket, though, the side vegetables sounded good on the menu but were prepared as an afterthought, tending towards mushiness and too oily. I bet they will get this together though with time, because the majority of the food was just so well seasoned and expertly prepared. Minimal intervention seems to be the rule too, they let the steak, pork, and chicken sing for themselves, not an over-abundance of salt, butter, or fancy garnishes. The only real issue they seem to have right now, though, is dessert. We tasted 5 of them and not one was worth ordering, in my opinion. They seemed to be trying too hard (passion fruit foam/gel/pudding with ginger cake, for example), and lost touch with basics. The butterscotch ice cream was delicious though. Overall, Farm on Adderly is a very good restaurant, and a good value too. I'm not sure that it will satisfy you as a "destination" restaurant, unless part of the thrill comes from going to Ditmas Park. Smoothing out a few edges might change this, as this place has LOADS of potential. And that said, if I lived in Ditmas Park I would have a table with my name on it. This is the courtyard of the National Archive building (I think) in the 4th Arrondisement, in the Marais. It never ceased to amaze us how utterly beautiful the courtyards are, and how incredible the buildings are, those that are not even tourist attractions. This one was near the Picasso Museum. When you poked your head through the doors this was the view. And here is the Pantheon. Next is a view from looking over the Seine. Here is the Palais Royale. And here is my last meal in France, a wonderful house-made plate of charcuterie including tete de veau (veal head terrine), boudin noir (blood sausage), some unidentified meat, some lardons, and of course, cornichons and mustard. 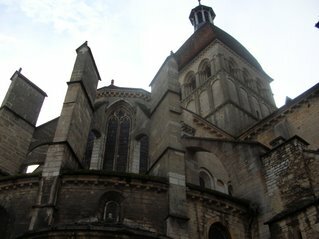 That's right, I have now finished posting about our Burgundy trip. But before I completely leave France, I want to mention a few of the places we ate in Paris, and share a few notes. It's not easy to decide where to eat when you love food and there are incredibly cute and yummy looking places on every corner. We were lucky - a friend recommended several restaurants and they were excellent. Our first night in Paris was a rainy one, but that didn't stop us from walking a bit of a ways, from our tiny hotel room near the Odeon to the 7th Arrondisement. We passed through streets lined with imposing government buildings, guards and security cameras posted outside. I took us to Le Sancerre, a place that one of our books foolishly desribed as "one of the best wine bars in Paris." It was cute enough, but the lady who owned the place had 2 whites and 2 reds and didn't know who produced either of them or where they were from. BrooklynLady is so good at sussing out restaurants before traveling. She always has a few places up here sleeve, and she pulled out a winner on this night. 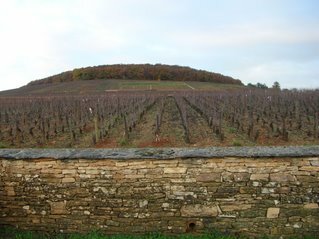 When we decided not to stay at Le Sancerre she said "I know a place near here," and we went to Le Petit Troquet on Rue L'Exposition. A very small space, but thankfully nonsmoking. And everything was well prepared and tasty. I had a green salad, something I missed while in Burgundy, BrooklynLady had snail risotto (I was so proud of her). I had a roasted white ocean fish (who knows what kind?) as an entree with simply prepared leeks and carrots, and BrooklynLady had lamb shank over white beans. Plum clafoutis (a kind of tart/cake with plum halves on top) and an apple financier for dessert rounded out this yummy meal. The winelist was undistinguished a tthis otherwise fantastic restaurant. Highly recommended. Our second dinner was a homey one at Le Germain, also in the 7th, right near the Bon Marche, a place we never would have found on our own. Our friend told us about this place, describing it as a place to enjoy "grandmere cuisine, inexpensively." This is an accurate review. The place was tiny, with maybe 8 tables, and definitely low key, but everything was delicious. From the glass of Champagne (I asked for the name of the producer and forgot it)I had before dinner to the mustardy green lentil salad appetizers to the roast chicken and the poached fish with basil sauce...delicious and simple. I was a little surprised at how hip and leather jacket cool our table neighbors were - they looked like they just walked off the set of a soap opera and came for a cast dinner. Highly recommended. We went to Bouchon de Francois Leclerc for our fancy and expensive dinner. There are a few of these, and they are known for their winelist - fine wines at wholesale prices, supposedly. First of all, the map honestly made it seem as if it would not be too far of a walk from our hotel to the restaurant, but as anyone who knows Paris will tell you, from the Odeon to this place in the 8th Arrondisement is at least 3 miles, probably more. We were sweaty, discombobulated, and generally a mess when we arrived a half an hour late for our reservation, but somehow we still got our table although there was a line. The food was nothing special, but it was fine. The wine list was deep only in the Bordeaux region, everywhere else represented by only a couple of obvious bottles. And wholesale this was not, although the prices were lower than is common in restaurants. We went with the Bordeaux flow and enjoyed a bottle of 2001 Chateau Gloria, St Julien, E38 with our dinner. Surprisingly good, with cassis and some olives and herbs on the nose. Herbal and cedar notes complimented the dark fruit, cassis flavors. The restaurant, though was only Average (and really expensive). Chez Hamadi on Rue Boutebrie is a cous-cous joint recommended by the same friend who told us about Le Germain. She was right on again. 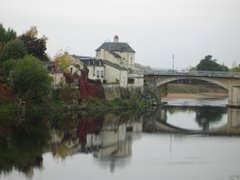 This place was in the 5th Arrondisement 10 minutes from our hotel. For an absurdly cheap amount of money we had some sort of omelet appetizers and then what truly is the finest cous-cous I have tasted, served with harissa. BrooklynLady had stewed beef and I got the house made Merguez sausage. Dessert was sweet mint tea. Magnifique! Highly recommended. Thank you France! We loved you, and we hope that you will allow us back with our not-yet-born child one day. Gourmet Magazine, usually quite reliable in my opinion, described La Table D'Olivier Leflaive as a great place for lunch, the tables filled with local vignerons. We went there for lunch on our last day in Burgundy and although we had a very nice time, on this occasion Gourmet got it wrong. La Table is a technically a restaurant, yes, but it's more like eating at somebody's house. Somebody who happens to produce at least 15 different wines and serves you tastes of each wine during your meal. Somebody who also uses the occasion of your lunch to aggressively pitch their hotel, wine touring, and other related businesses. The space was still being built out, but our table was comfortable and the decor quite pleasant. There were most definitely no vignerons - this is tourist group dining all the way. One huge table of Japanese tourists, another of US southerners, another table of Brits. And tourist prices too. Lunch for one was E50! Sure, it would have been E40, but that version included tasting only 5 wines, the entry-level Aligote and Bourgogne wines. E50 got you the "grand tasting" which included the village, 1er Cru, and Grand Cru wines. I asked Msr. Leflaive during his obligatory 'meet and greet' at our table if there are any Oregon Pinots that he likes. He apologized, and said that he doesn't like them too much, too big and extracted, he said. But there is one that he likes a lot, although he couln't remember the name. "Saint something or other," he said. "St Innocent?!?" I asked. Yes, in fact, St Innocent. My favorite too. We enjoyed our lunch, but 3 courses took way too long at 3 hours (and there was no way to speed things up - only one waitress for all of those tourists), and it was far too expensive for what you get. The food was tasty to be sure, but utterly simple, and there were no choices. They brought us a bowl of plain white rice and a dish of pork loin cooked with creamy mushroom sauce. Tasting all of the wines was interesting though, and I gained some insight into recent Burgundy. The 2003 wines we tasted were flabby and unfocused - the heat really did cause low acidity, which really does impare wine! Not like I didn't believe this, but tasting a vertical of the Puligny-Montrachet makes this a personal experience, not just something I read in wine magazines. We loved our dinner that night at Le Ciboulettes, a small bistrot just inside the walled area of Beaune. Incredibly cute decor and attentive and friendly staff set the tone for the whole experience. The expansive winelist reminded us that BrooklynLady had not yet had a whole glass of wine, as she promised that she would. Well that was all the prompting I needed. I closed my eyes (but opened my wallet) and ordered a bottle of 1990 Voillot Volnay 1er Cru Les Caillerets. This was the wine of the trip for us. Clear and pretty light ruby color. Nose of earth and wet cement, like a cellar. Then opening up to reveal floral smells and wet mud. Very round flavors with almost no tannins left. Sweet stewed red cherries with some earthy mushroomy tones, and a lingering cherry and slightly bitter cranberry finish. This wine was power and grace, fruit and soil, youthful and mature, good and evil, peaceful and warlike, and whatever other incompatible terms you want to throw in. Just beautiful! I have posted before about Voillot wines and I think that this producer represents a good value in the pricey world of Burgundy wine. Two brief words about the food at Le Ciboulettes - utterly delicious. We had pumpkin soup with cumin, an unexpected and exciting flavor combination, mussels in seafood broth, veal with wild mushrooms, and braised pig cheeks. Of course there was a cheese course, and this one was every bit as good as Le Charlemagne's. Creme Brulee was also top notch. A wonderful meal with amazing wine for our last meal in Burgundy. Ever feel like giving a little something to charity? I usually do each year, but I have a hard time finding the charities I like. Giving to a massive organization makes me feel like my small amount of money is meaningless, that it vanishes into the abyss of waste and overhead that plagues so many charitable organizations. I always give to WNYC, my local public radio station, because I listen every weekday and I figure that I owe them. But I was just talking with BrooklynLady about finding some other way to give a little something in a meaningful way this holiday season. Here is one solution: Menu for Hope. Organized by bloggers, this is a fun way to contribute to a good cause. For every $10 you donate (and you can donate as little as $10 - lots of people do), you get one raffle ticket that you can use in a drawing for the prize of your choice. Click here to get to Alder Yarrow's blog Vinography, and follow his easy instructions for donating/entering the raffle. There are some great prizes - wine, food, books - all kinds of stuff. Take a minute to check this out. We're talking about a meaningful contribution here - you would be helping to put together a gift of about $20,000 - that's right, $20,000 raised by normal people like you and me, not corporations. This year the money will go to the UN World Food Programme. And you don't have to part with loads of dough. Do you have $100 or less that you would donate to charity right now? Then this is for you. Wine Blogging Wednesday # 28 - Sparklers! 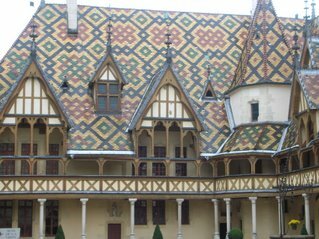 I hereby interrupt this string of Burgundy Trip 2006 posts to bring you...Wine Blogging Wednesday!! 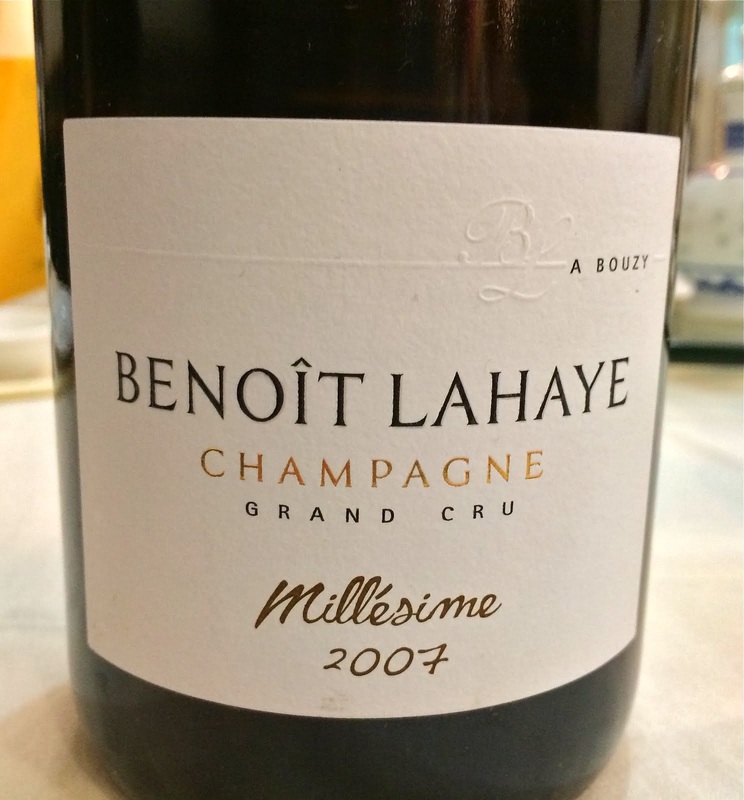 Non-Champagne sparklers are the subject of this month's installment of Wine Blogging Wednesday, an online community tasting organized by Lenn at Lenndevours over two years ago. The Culinary Fool is the host this month, and graciously provided a helpful set of preparatory posts, with loads of information about various sparkling wines - worth reading. I was all set to review the new version of one of my favorite sparkling Loire wines, like the Chidaine Montlouis Sur Loire with its expansive flavors, or the Francois Pinon with its apply yumminess. But when I got to the store I was in a strange mood and I wanted to try something completely different. Something that I would probably never order in a restaurant, something that I normally do not have occasion to taste. I went with a sparkling sweet red wine from Lombardy, Italy, whose name in English translates to Blood of Judah. Why Judah, the traitor? Is this wine meant as a warning to those with impure thoughts? Before you do whatever badness you are contemplating, sip this wine and remember Judah? 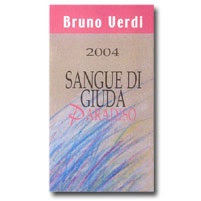 2005 Bruno Verdi Sangue di Giuda, $13. Deetrane: Impenetrable purple color, bordering on black. Restrained nose of apples; gripping, sweet but simple palate of black cherry. Delightfully acidic and bubbly finish. A great everyday dessert wine for impressing unsuspecting guests. Brooklynguy: Medicinal piney nose, with hints of tarragon and some earthiness. No visible bubbles, but mild fizziness on the tongue - probably classified as a Frizzante. Black cherry rush with cola flavors. Surprisingly long finish. A simple wine that would go great with chocolate (which we tested with an M&M Amazing bar, and it works), or even a piece of pie. Winelover's Page: click here for some more tasting notes. After a half hour open and further swirling and sipping, we summarized that although this wine is quite enjoyable and definitely scores points for its novelty, it essentially tastes like adult soda-pop. And I wrote that before I read the notes on Winelover's page. Think cream soda mixed with Dr. Brown's Black Cherry. Yummy, right? And at merely 7% alcohol, you could serve it to the kids at a pizza party and they would lap it up, and then nap afterwards making it easier to get them home. I'm not trying to trivialize this wine - it has an interesting nose that includes some pine scents. A pairing with chocolate mousse comes to mind, although one could become diabetic just imagining this. I could picture serving this on a hot summer night on the porch, maybe in lieu of dessert. But I find it hard to take this wine too seriously. I cannot honestly recommend this wine other than as a curiousity, but I also cannot call it a dud, because it isn't a dud. Its good, for what it is - very sweet red fizzy juice. If that's what you're in the mood for, go for it. Thanks again to Culinary Fool in Seattle for hosting, and for providing the inspiration for me to try something new. Check out the round-up of 33 bloggers and their experiences tasting various sparklers on Culinary Fool's WBW #28 post. BrooklynLady and I continued our white Burgundy education at Domaine Lafouge. We were guided by Jeanne Marie's assistant Pierre-Henri, a gentlemanly young fellow. I followed him to Auxey-Duresses in our tiny car, and he gave us the wonderful gift of driving through a maze of back roads, past famous vineyards and old picture-book houses, the morning sun's rays poking through the fog. I almost drove off the road a few times while gawking at the astonishingly gorgeous scenery. I just used a couple of "pumped up" adjectives: astonishing and gorgeous...and I want to take this moment to tell you that I truly mean them, and that in fact there are no words to explain the sensory experience of those back roads. We were greeted at the Domaine by the elder statesman Jean Lafouge. I think that he may have raided Paul Pernots closet when dressing for work: he had a worn pageboy cap, a blue wool sweater with another sweater, a cardigan, over the first one, and canvas workpants with a few muddy stains. He says that he now merely consults in the winemaking, and that his son Gilles really makes the wine, so maybe those stains are from years past. 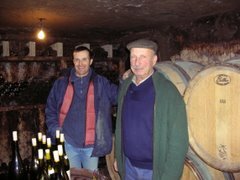 I will say that Jean Lafouge was the most charming man, the most friendly and open, the most relaxed of the vignerons we visited. He graciously helped my pregnant wife at every opportunity, placing the spit bucket close to her, offering her water, generally making sure she was comfortable. His son Gilles appeared for a moment and he was charming too (and seems to have diverged from the winemaker's costume). Jean Lafouge is a 5th generation vigneron, and his pride and respect was evident for his son as the up-and-coming sixth generation of Lafouges to make wine in Auxey-Duresses. 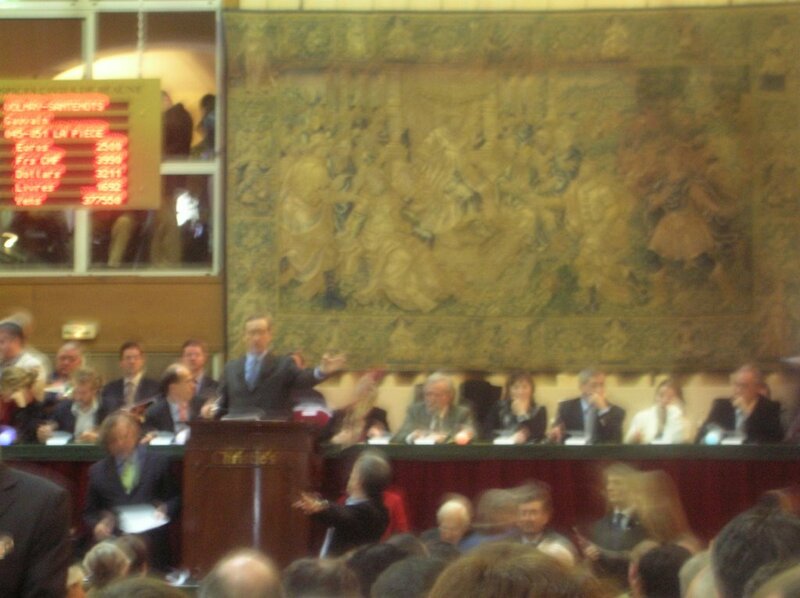 2005 Auxey-Duresses. Big nose of vanilla and toast, full fruity palate with lots of baby fat. 2005 Meursault. Tough to coax a lot from the nose - very reserved. Prominent minerals on the palate. I had no idea about the true character of this wine. Jean Lafouge told us after tasting it that the wine was completely closed up that day (from recent racking?). 2004 Auxey-Duresses. More balanced than the 2005, with a more focused palate of fruit and toast. Still, maybe not my favorite style of white Burgundy - very big and full bodied. 2004 Meursault. Clean citrus smells, some nuttiness, some flowers. Lemons, sweet but refined fruit and nice minerality. This wine had a lithe and skinny structure to it, very elegant. Clearly the best of the bunch right now. 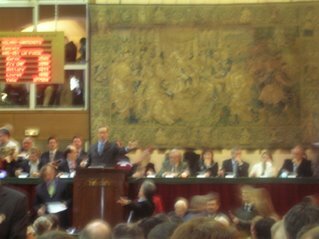 2005 Auxey-Duresses. Lean red fruit smell, apple peel acidity and cranberries dominant. All high notes, nothing grounding this wine in the way of earthiness. 2004 Auxey-Duresses. A bit more developed in the nose, but very reserved fruit. This wine had a crushed aspirin like flavor that reminded me of the Ladoix wine we had at La Terrace de Corton, and did not enjoy. I think I learned that Auxey-Duresses is not my favorite village in Burgundy. 2005 Pommard Les Noizons. I like the smells here, there are doark flowers and sappy dark fruit. Kind of gawky palate though, still very young. Seems to have a nice balance of fruit, spice, tannin, and acidity - seems very promising indeed. 2004 Pommard Les Noizons. Great floral aromas, and some red cherries. Finesse, feminine red fruit style, silky texture, very compelling. We decided based on the quality of the two Pommards, and the lovely feeling we enjoyed while visiting the Domaine Lafouge, that we would order a magnum or two of the 2007 vintage wine to keep for our child, who will be born in early 07. The Domaine Paul Pernot was the largest producer we visited, although Pernot is middle sized by Burgundy standards. I have been looking through pages of search results and I cannot find anything informative about this producer to share with you, so I will do the best I can on my own. I first tasted a Pernot wine a little over a year ago and it was a 2003 Bourgogne red wine. I was not terribly impressed and I didn't seek more of the wines. Who knows...maybe I just needed more experience with Burgundy, or maybe 2003 Bourgogne is just not going to be that impressive in general. But I have a true appreciation for Pernot wines now. First of all, the wines show real balance and purity. They are not blockbusters (I cannot talk about the two Grand Crus as I have never tasted them), but are somewhat austere and subtle. I found that the aromas in the young wines were quite reserved, but that might be because there is not as much new oak used in most cuvees as other producers use. The aromas of the grape take a little whie to reveal themselves. Secondly, this is a producer whose 1er Cru wines will not destroy your wallet. The 2005 Puligny-Montrachet1er Cru les Folatieres retails for about $40, and its really good! 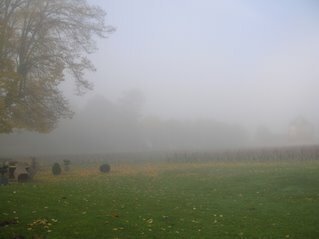 It was raining quite hard when we arrived in the beautiful village of Puligny-Montrachet. We ran up to the cellar door and knocked, holding our coats over our heads. After a few moments the door opened and a small gray haired man welcomed us inside. Paul Pernot is a caricature of a winemaker. Small but quite stout, completely gray and into his 70s, he wore a pageboy cap, a rumpled apron over his canvas workpants and shirt, and an old blue cardigan sweater to protect against the cellar's chill. BrooklynLady is convinced that the Institute des Vignerons in Beaune issues this outfit to all winemakers when giving out licenses. We went to a corner of the cellar used for tasting, a dimly lit area with a barrel for a table, several glasses and unlabeled wine bottles waiting to be opened. There were a few notable empty bottles on a shelf above the door: a 1945 Cos D'Estournel among them. As he began to uncork bottles, I noticed that his hands were huge and scratched up - he looked as if he had just finished throttling a horse. 2005 Bourgogne. Straightforward and pleasing, some citrus smells. Nice medium bodied texture, hints of vanilla and stone fruits. More elegant than the other 2005 Bourgogne whites that I tasted. 2005 Puligny-Montrachet. Citrus and flowers on the nose, pretty tight in the mouth, but with some swishing about there are clean citrus and white fruit flavors, and a definite mineral sense too, like wet stones. 2005 Puligny-Montrachet 1er Cru les Folatieres. Smells were hard to make out, although the nose was very pretty. Just a bit jumbled. Some lemon balm, a touch of honey? Tightly coiled and pure flavors of cirtus and white flowers, a little toastiness to it, and a piercing finish, as if the flavors were ready to uncoil after spitting the wine (yes, we learned to spit in Burgundy). I think this wine is a great value, and if I can find it in NYC I will buy a few bottles for cellaring. 2005 Beaune Clos de dessus les Marconnets. Austere smells of raspberries and stems, still quite tannic, in the mouth too. Too early to tell what's going on with this wine, although it was light on its feet and pwerful too - seems to have potential. 2001 Beaune Clos de dessus les Marconnets. WOW! We both loved this wine. Drinking perfectly right now, lovely perfume of dark flowers, red fruits, and earth. Silky texture, all velvet in the mouth. Light feeling, but pure and piercing flavors of red and black cherries with a perfumey and earthy backbone. Just lovely - I would pour this for any Burgundy lover. And if I can find it I will grab a few bottles for drinking over the next few months. David Lillie at Chamber Street Wines put us in touch with Jeanne Marie de Champs, an exporter who represents about 60 Burgundian grape growers. 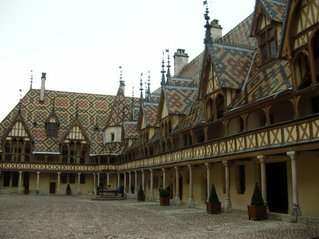 She got us tickets to the Hospices de Beaune auction, and she made appointments for us to visit a few of her growers, and we didn't discuss our tastes before she made the appointments. You know how when a friend is at your house and they pick out music from your CD book, they tend to pick something that you don't listen to very often, and it is usually a pleasant surprise? For some reason, it didn't occur to me that our appointments might be with producers who focus on making white wine - BrooklynLady and I are Pinot lovers, and are basically ignorant about Burgundy whites. When we learned that we would be visiting Domaines famous for white wine, we were excited. We would probably have focused entirely on Pinot Noir if left to our own devices. We drove with Jeanne Marie to Meursault on a Tuesday morning to visit Domaine Fichet. I forgot to bring the camera, which explains why I cannot post photos of the lovely buildings in the village. Jean-Philippe Fichet's house was quite large, and the winery even more so. We walked into an absolutely spotless room that receives the picked grapes, with a circular drain in the middle of the floor. The 2006 grapes were apparently pressed there only weeks ago, but you could never tell - it was clean like a hospital room. We walked through a cellar where the 2006 wines were adjusting to new life in barrels, and into a larger cellar with both barrels and big red steel tanks. The Aligote was, as Jeanne Marie only half jokingly said "to get your mouth rid of coffee or whatever you had before you taste the wine." I'm not so sure that the winemaker appreciated that comment. The most obvious thing I learned in this tasting was the way that the wines increased in complexity, and what complexity actually means, to my thinking. 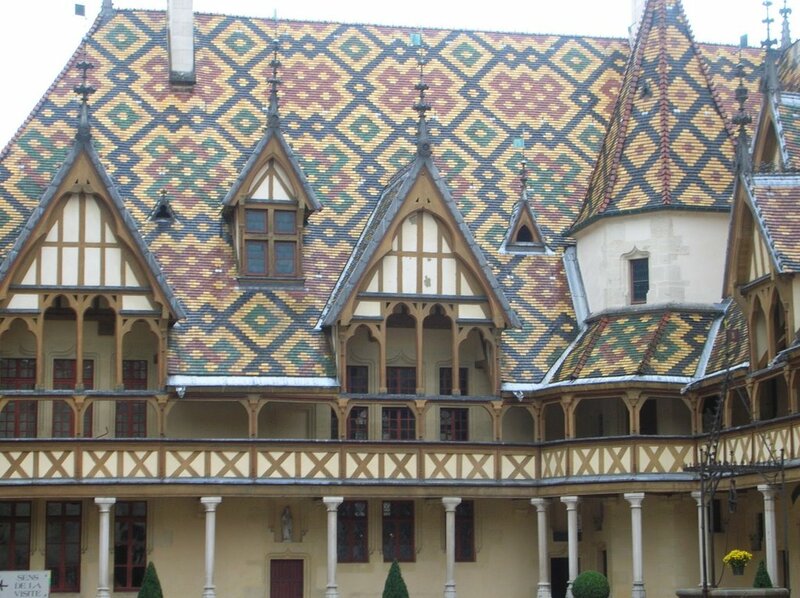 Some of the characteristics of Chardonnay from Burgundy; freshness and vibrancy of fruit, specific fruit flavors, the nature of the acids (structurally, and in flavor - lemony, apple peel), vanilla and other oaky flavors, minerality, texture...all of these characteristics were present to some degree in each wine. And I believe that I could have opened any one of the wines on its own and enjoyed it, smelling and tasting some of those characteristics. But tasting them in succession allowed me to understand what I think is meant by "complexity," the way that the characteristics harmonize with each other yet are still individually identifiable in a complex wine. Wines that are not as complex featured instead one or two of the characteristics prominently, and the others were not accessible. The Meursault wines were much more focused in their flavors. The Auxey Duresses, for example, was very tasty, but in a flabby way. Compared to the Meursault Les Chevalieres, it was fat sweet fruit all over the place. The Chevalieres had clear lines of lemony acidity, a clear backbone of minerality, and young and tightly wound but delicious fruit with a nutty character. The Meursault wines were lighter than the others in texture and color, but they packed much more power. 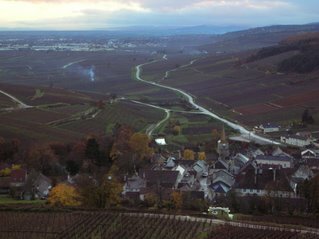 And within the Meursaults, Les Chevalieres and Les Tessons had more grip and potential energy than the Village Meursault. They clearly had a lot of developing to do, while the Mersault was more approachable now, its flowers, lemons, nuts, and stones already on display. This was for both of us the most profound tasting experience with white Burgundy and Chardonnay in general up until this point. We followed this with visits to Domaine Paul Pernot and Maison Olivier Leflaive, and I will describe those soon. Many restaurants in or near Beaune are closed on Monday nights, and this being the Monday after the Hospices de Beaune auction weekend, we figured that we might have to eat dinner at some chain restaurant such as the "Buffalo Grill," the oddly Texan-themed place we saw one day. But fear not, the knowledgeable staff at Hotel Villa Louise, our little hotel in Aloxe-Corton, pointed us in the direction of La Terrace de Corton, a place in Ladoix with a "Bib Gourmand", a recognition from the Michelin Guide that the restaurant offers a very good meal for $40 or less. This dinner turned out to be quite memorable, both for the food and the company, if sadly, not for the wine. It was pouring Monday night and we were starving by the time go to the restaurant, located on Rte 74 - no backroad navigation necessary. The decor was pleasant, a country inn type of style with large fireplace in the front room. Ours was one of four tables occupied in the whole place - a slow rainy Monday night. A group of 6 guys sat at a large table loudly enjoying themselves, a suave looking middle-aged man dined alone, enjoying a half bottle of white with his first course and then a half of red with his main dish, and a handsome middle-aged blond woman sat at the table closest to the fire with her yellow lab for company. She had a 750ml bottle of red to herself. BrooklynLady began with a local specialty, a slice of country ham with parsley. This dish appeared on almost every menu in Burgundy. A thick slice of ham, not too salty, a hearty chewiness, almost nutty in flavor, with a cool and mushy parsley gel, very fresh and green. A great contrast of texture and flavor, and the accompanying cornichons were delicious too. I started with another local classic - poached eggs in red wine. I could eat this every day if my cardiologist would only loosen up. Three small perfectly poached eggs arrived on pillows of carmelized shallots, all on top of a pool of heavenly sauce made with red wine, more shallots, bits of thick slab bacon, plenty of butter, and I don't know what else - but c'est magnifique! We then shared escargots prepared traditionally, marinated in Chablis for a while and then cooked with loads of garlic, parsley, and butter. Escargots in Burgundy are like pastrami sandwiches in New York: they are a part of what makes the local cuisine famous, but it is a dish that locals very rarely actually eat. Anyway, these snails were just yummy, so earthy, with flavors that stayed on your tongue after the plate was cleared. A long finish, I guess you would say. BrooklynLady then had coq au vin - tasty, but this was truly a coq - a chewey rooster. I ordered a steak, which the chef trotted out into the dining room and grilled in the fireplace. He served it rare with 5 different mustards, including red wine mustard, almond mustard, and my favorite, the tarragon mustard. Continuing our "when in Rome" policy, we ordered a half bottle of Ladoix wine, the 1999 Domaine Ravaut Ladoix 1er Cru Les Basses Mourottes. We picked this wine because we thought that it would be mature and ready for drinking. 1999 is supposed to be a great vintage for red Burgundy. 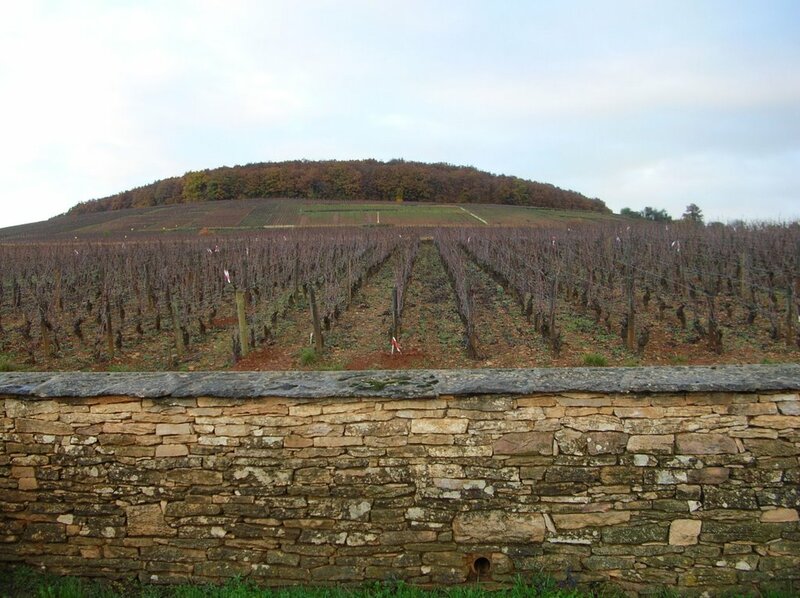 Although opening a 1999 1er cru from a place like Chambolle-Musigny might be premature, we guessed that a lesser known Cotes de Beaune wine might be ready. It had nice cherry smells and a pretty light red color. But the palate was dominated by a yogurt like, crushed aspirin type of flavor. Very little happening in terms of a mid palate, and a strange vegetal finish. Maybe the wine was not ready for drinking, possibly it was an off bottle. It was not, for me, an auspicious introduction to the world of Ladoix wines. By the time our main course had arrived, the suave gent had begun a clever tactical assault on the blond woman. He was an Englishman who lived in Spain, but was driving his 1950's Porsche to the one guy in Germany who could repair it. He stopped at this restaurant because it is also a hotel (convenient). She was Danish, travelling on business, missing her husband (for the first part of the conversation anyway). By the time there was only a little wine left in her bottle, she was giggling at enjoying everything he said. My favorite moment was when he said, after learning that she was also staying the night at the hotel, "So will that dog sleep quietly through the night in your room, then?" BrooklynLady and I spent our drive back to the Villa Louise imitating their funny conversation, these people who were grandparents, enjoying their flirtation on a rainy night in Burgundy in the absence of their respective spouses for that night. I imagined that he walked her to her room, tried to buy an overnight ticket, and was rebuffed - that she was flattered but was never actually considering going further than flirting. BrooklynLady disagreed, and was quite certain that the dog was barking that night. If so, I hope that the next morning they stayed in bed and had poached eggs in red wine sauce. After a morning enjoying excellent wine in upstart Pernand Vergelesses, we decided that it was time for the classics, something monumental, something from Cotes de Nuits. As we had no appointment (foolish, I know, but we had appointments at several Domaines over the next few days), we decided to visit Moillard Grivot. I am not usually drawn to large negociant houses, but I read through Nikolai Vogel & Kilian Fitzpatrick's lovingly written descriptions of their Burgundy tasting trips. They recommend Moillard Grivot as a great place to taste wines from various villages and to compare, to learn something about the terroir. And you don't need an appointment. The Moillard Grivot house in Nuits St Georges was right on the main road with easy parking. The house was literally the tip of the iceberg. When you walk in you can go downstairs to a monumental cellar and walk through aisles upon aisles of barrels and bottles. Like an airplane hangar - HUGE. And a sign said that only 10% of their wine is cellared in that facility. After our cellar tour we entered the well-lit tasting room, decorated with maps, racks of wine bottles, and what looked like water fountains at the dentist's office, but were in fact modern spittoons. The guy behind the counter gave us rather large glasses (nice - a lot of our tasting was done with too-small glasses) and left us alone with 5 open bottles. We poured, swirled, sniffed, and tasted as we pleased. We probably could have had lunch delivered to enjoy with the wine and they might not have minded. 2005 Moillard Grivot Meursault 1er Cru Charmes, E29. Great nose of lemons and honey. More reserved in the mouth, with some banana and citrus, some minerality. Well balanced, young. I really liked this wine. 1999 Moillard Grivot Nuits St Georges, E24. An earthier, almost musty smell. Not revealing much fruit in the nose. Sappy sweet cooked red fruits in the mouth balanced by a pleasant bitterness at the finish. I did not like this wine upon first tasting it, but the more I smelled it and after a few more sips, the more drinkable and balanced, delicious in fact, I found it to be. BrooklynLady simply disagreed with me - she did not like this wine, found it to be past its prime and cooked. 2004 Domaine Charles Thomas Bonnes Mares, E67. Darker than the others with completely different aromatics, featuring cinnamon and some wet cement, with dark black cherries. Flavors are sweet and spicy with red and black fruits present, and earthy pine sap. Lots of tight tannins remind you how young the wine is, how much the flavors and aromas will develop over time. Okay, so I get it now. There is something to this Grand Cru business. Tasted alongside the more mature wines of lesser designation, this wine was an absolute powerhouse. When we were done tasting we were surprised to learn that there was no charge - the tasting was free. I recommend stopping at Moillard Grivot to anyone who will be in Burgundy for more than a day or two. Such a pleasant environment, and such a great way to learn about wines of the Cotes de Nuits, tasting them at your leisure, side by side. The next morning we drove back to the village, even more lovely in the daylight, and up the hill through the narrow streets past picturesque houses and several Domaines and tasting rooms. Before doing any tasting we drove past town, even further up the hill, and to a point advertised as "Panorama," a site at the very top of the hill overlooking the whole valley. Still morning, this was shrouded in fog, and it was far too scary to even get out of the car. 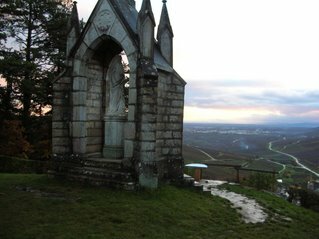 We returned in the evening though, and on the left you can see the view (with monument). 2004 Pernand Vergelesses, $11. Straight forward smells of red fruit, simple and enjoyable wine. A bit tannic - might be better chilled. 2003 Pernand Vergelesses Les Belles Filles, $13. Surprisingly dark in color, with fresh smells of violets and earth. Sweet and sappy dark fruit, but with a light feeling and a pretty floral finish. A great value at this price and drinking well right now, this is one of 3 bottles that I brought home from France. 2005 Pernand Vergelesses 1er Cru Les Fichots, $20. Lighter in color, with reserved red fruit smells and flavors. Way too young to really tell what's going on here, but the wine seems well balanced in that I can make out some fruit, some acidity, and some earthiness amid the green tannins. 2005 Corton Grand Cru, $40. Darker again, with rich musky smells. Some blackfruit on the palate, but too tightly coiled to tell what's going on. Seems promising based on the interesting animal smells. 2005 Pernand Vergelesses 1er Cru Sous Fretille, $20. Stronger smells, citrus and some fruit. Good acidity and young ripe fruit, some fat on the sides of the tongue. Richer in texture, this seems like it will become an excellent wine. 2004 Pernand Vergelesses 1er Cru Sous Fretille, $20. Interesting to compare to the 05. A more expressive nose with some flowers and some fruit. Lighter mouthfeel with young but vibrant stone fruit flavors and clean acidity. Very impressive. A more delicate profile than the 05, but it had an extra year of development. 2005 Corton Charlemagne Grand Cru, $48. Very reserved nose, more stones than anything else. Some hints of bright fruit but very young and tight flavors. At this point I am probably too inexperienced with white Burgundy wines to have picked out the flavors of the young Corton Charlemagne. I improved over the next several days though. If you are interested in trying to find wines from Pernand Vergelesses, any shop that carries a good Burgundy selection should have something. Problem is, it might be Grand Cru Corton Charlemagne, or something like that, and quite pricey. Village level wine from Pernand Vergelesses represents great value. Your best bet might be to look for the wines of Domaine Rapet Pere et Fils- reasonably priced and available. The finest meal of our France trip, considering both Burgundy and Paris, was most certainly our dinner at Le Charlemagne, a smart and beautifully designed restaurant nestled in at the base of the hills in Pernand Vergelesses. Walkable at about a mile and a half from the Villa Louise, our lovely little hotel in Aloxe-Corton, we drove because nothing other than the moon illuminates the narrow road through the vineyards. It was a beautiful drive through a valley, expansive views of hills and vineyards, and of the lights of Beaune in the distance. Le Charlemagne is owned by the very young chef Laurent Peugeot and his wife Hiroko, originally from Japan. They also own the popular sushi place just outside Beaune called Sushi Kai. Part of the idea at Le Charlemagne is to fuse classic Burgundian cuisine with that of Japan. This merging of sensibilities was on display immediately upon arriving at the restaurant - the building itself looks like part of a chateau that spent several years in Japan. Tall drowsy bamboo growing outside, swaying in the breeze, and cedar planked walkways that guide you up towards the second floor entrance. The interior is reminiscent of a Buddhist temple, very spare with wooden floors and simple white walls. And a temple it is, a temple of thoughtfully composed and skillfully executed haute cuisine that is sometimes shocking in its kinetic energy, and always beautiful. After ordering we were presented with a shot glass containing an amuse-bouche of shrimp in a dill gel with shellfish creme. This, along with the bread that came piled vertically on a somewhat menacing looking skewer, served as a message about what was to come - inventive presentation, to say the least. BrooklynLady started with Veau du limousin, kind of like tuna tartare with small chunks of veal. Absolutely delicious with its light miso vinaigrette, but sadly BrooklynLady was not eating raw tuna so after a few illegal bites, she adopted my escargots ravioli with edamame bouillon and escargots butter. That dish was artfully presented - the fried ravioli resting on 2 chopsticks that served as a bridge over the bowl of edamame bouillon. BrooklynLady had a shortrib cake with shallot and red wine gel for a main dish. Amazing! Perfectly textured and full of rich beefy goodness. This one is called Parmentier de Queue de boeuf on the menu (which you can see if you click on the link to the restaurant, above). I had quail with tandoori spices with another treat in a shot glass, this one some sort of souflee. I think it was cheese, but BrooklynLady suspects puree of an organ meat like kidney. Again, I go with cheese, and I think the menu supports my claim. Anyone know what "potimarron" means? Then came the kicker - a salmon "pizza" delivered in a box like they use at Joe's in Brooklyn. A comic flourish for sure, but this was very serious pizza indeed, so serious that the fate of our great nation might in fact depend on it (?). Thick slices of salmon and pickled sea vegetables were arranged on a potato galette - savory, with a great contrast of soft salmon and crisp pickled vegetables and potato. I tried using silverware but pretty soon I had to just pick it up with my hands like I was walking down 86th street in Bensonhurst. With all of this food I ordered a half bottle of 2004 Domaine Pierre Maray at Fils Pernand Vergelesses. The wine list was quite extensive, including many half bottles, but I figured that I'm in Pernand Vergelesses, so why wouldn't I try the wine from the village? We were well rewarded - bright and floral with good citrusy acidity and some hints of honeyed richness, this wine worked great with food. We were so impressed that we resolved to come back to the village to try more wine. The cheese plate was phenomenal. A helpful waiter selected cheeses for me from an old school cart, including Ami d'Epoisses and Epoisses (the description on Fork and Bottle is as good as any other), creamy and quite strong cheeses made locally, and tasting of grass, flowers, and the laundry hamper in the boy's locker room. Dessert began with another shot glass, this time filled with pear sorbet and clementine chunks. BrooklynLady had Yuzu (a Japanese citrus fruit the size of a lime but orange, with a sweet/tart flavor), Mascarpone, and Genmaicha, an inventive sweet that combined creamy cheese with tart yuzu and green tea. I had chestnut ice cream with a chocolate cookie, very tasty. I learned in Burgundy that I really like chestnut as a sweet flavor. Dessert came a set of accouterments that strongly resembled a chemistry set. If you go tothe restaurant's website and allow the flash photographs to scroll by, a picture of this will come up. One test tube had a small green apple and white chocolate popsicle, another had what turned out to be poprocks, and another had what I think was that mixture of spices and tiny candies that you can take by the handful when you are leaving an Indian restaurant. The menu makes it look like we spent LOADS of money on this meal, but remember, they offer a set menu that allows you to have four courses for the same price as the beef shortcake a la carte. We floated happily out of the restaurant to the car (why I turned down what I'm sure was a luscious dessert wine) and said goodnight to Pernand Vergelesses. Le Charlemagne was an experience not to be missed if you go to Burgundy.